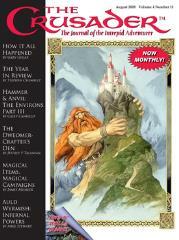 #11 "Magical Items - Magical Campaigns, The Year in Review"
An interview with Gary Gygax and his co-author Jeffrey Talanian. A special sneak-peak at the maps of the Castle, some surprise goodies, and the upper levels of the dungeons of Castle Zagyg. Explosive adventures or adventures with explosives. Fantasy takes on a life of its own in the Gygax’s dungeons and where we find a secret room, a rescued damsel in distress and other adventures. Continuity? We Don’t Need no Stinking Continuity! Every GM has a game that goes south, characters get out of control or encounters border on the ridiculous. Overcoming such an event and maintaining continuity is not as hard as it seems. This is a simple skill system for the Castles and Crusades RPG that maintains simplicity and “Old School” flavor while keeping a flexible method of resolving actions in the Siege Engine framework. I expand the detailing of significant wilderness areas and NPCs, providing maps and creative annotation. The Pirate’s Ship in a storm and the Prince Meltowg looses his footing and is lost. He finds himself a prisoner to slavers in the Gelderland. Highlight on breaking chains and bonds with strength checks. Are your players boring you? Then force feed them the pain.